“Very good price, very good price”, the bright-eyed boy in the yellow t-shirt poked his head through the car window. He spoke quickly, offering up Lord Shiva statuettes that dangled around his neck, arms and even from his finger tips. “Just 200 rupees, just 200 rupees”. He saw me grimace and changed tack, “Okay 100 rupees, divine price for Lord Shiva”. Such was the urgency in his dark eyes that I handed over 100 rupees for a figurine that I knew would end up as clutter, and placed it in my handbag. And before I knew it the boy was away, his yellow t-shirt luminous against the sun-drenched traffic as he zig-zagged through it. I was sitting in grid-locked traffic on the main artery that is the national road into the city. It’s like this here everyday with cars, busses, motor bikes and ox carts, inching their way to somewhere giving opportunists time to ply their trade. Roads are so dense with traffic that skywalks have been erected so that pedestrians can cross safely and not slow down the traffic any further. Through the car window I could see moving swathes of colour as women shimmied along the pavements in their pink, red and orange saris, sometimes slipping in and out of nearby bazaars and beyond that, the contrasting grey slums of corrugated roofs surrounded by plush high rise office buildings or apartments. This is Mumbai (formerly Bombay), of Slumdog Millionaire fame, and anyone who has seen the film would probably be surprised that actually, Mumbai is the financial powerhouse of India, where the stock exchange is the oldest in Asia and where real estate is the most expensive in the whole of the subcontinent. The sun was high and hot as I inched my way to the Taj Mahal Palace Tower Hotel, and indeed anyone venturing to the home of Bollywood would do well to start their tourist trail here. The hotel is ideally located for the bars and restaurants where those in the know would recognize a celebrity or two. And of course, for the sights. 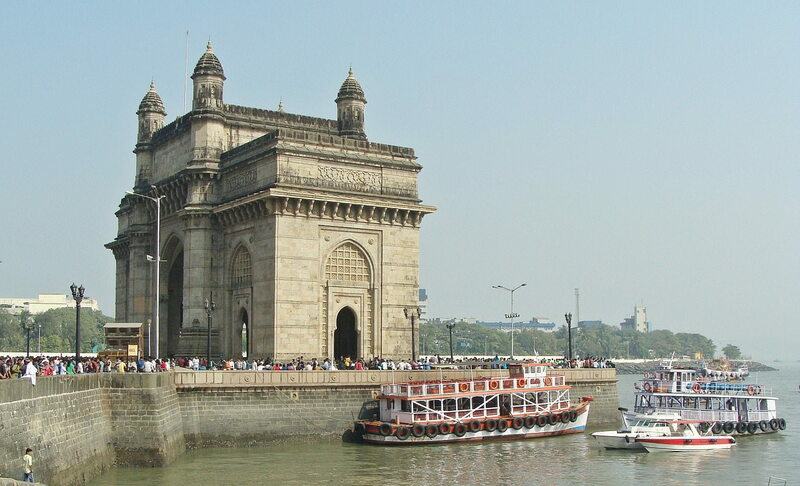 Opposite the hotel, overlooking the Arabian sea, is the monumental arch the Gateway of India. This symbol of both Old Bombay and modern Mumbai was built in the Indo-Saracenic style using yellow Kharodi basalt, it commemorates the visit of King George V and Queen Mary to Bombay December 1911. The arch stands at an angle on the square perched at the edge of the Arabian sea, where dozens of colourful leisure boats bob on their lees. 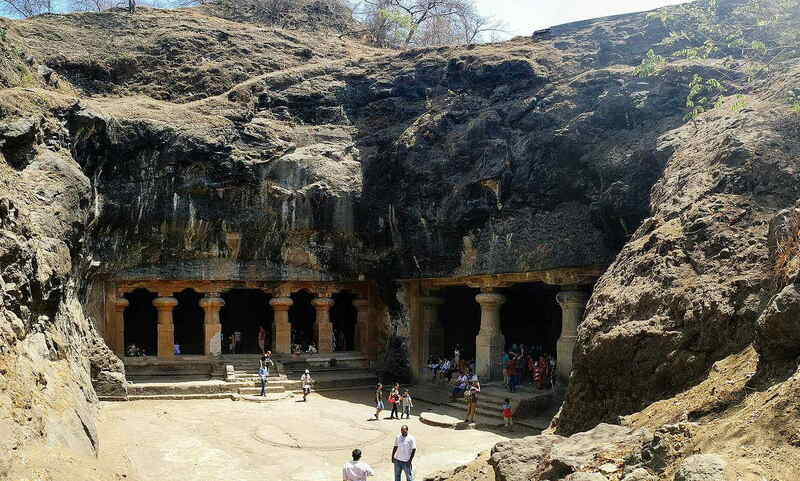 I caught a boat – a fifty minute sailing and a dinky train journey leads to the Elephanta caves on Elephanta Island. Not really caves, but a hugely impressive carving into rocks. Lord Shiva and other Hindu gods protrude out of the rock, telling stories of intrigue and reincarnation and a series of pillars give it the look and feel of a temple. There is no particular reason that 6th century kings took to creating this magnificent structure other than for arts sake and the love of their Lord Shiva. Behind the Taj is one of Mumbai’s most colourful shopping district – Colaba – a veritable, living creation of British rule. When the Brits first landed in the city in the 1600s the city was a group of seven island (all now connected seamlessly with bridges) and the shopping area spans two of these islands – Colaba and Old Woman’s island. Haggling is a way of life. I ventured a few suggested prices for items I didn’t really need just for the buzz of a bargain. 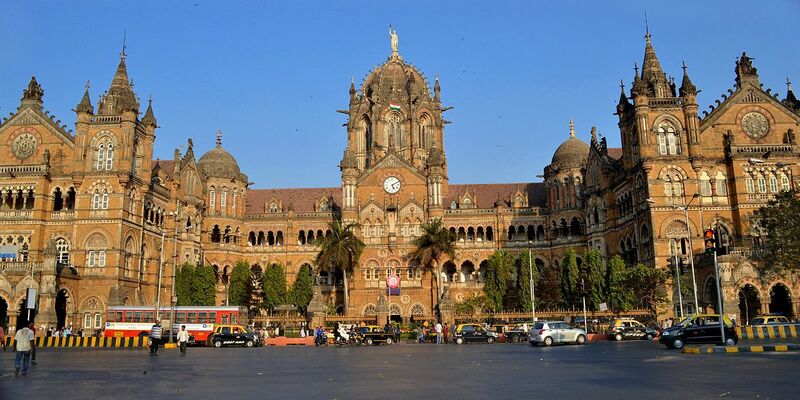 It’s easy to see British influence in the architecture and the most obvious is Victoria Terminal station renamed Chhatrapati Shivaji Terminus after British rule ended in 1947. A world heritage sight, yet this is a living, breathing train station, where three million people pass through each day on 1,000 trains making it the busiest and largest station on earth. Its sheer size is impressive, but the beauty of the station is awesome. Think St Pancras and quadruple it. Extravagantly ornamented, it combines neo-Gothic style of the early Victorian era with elements of traditional Indian architecture and gives more than an eyeful of pleasure. 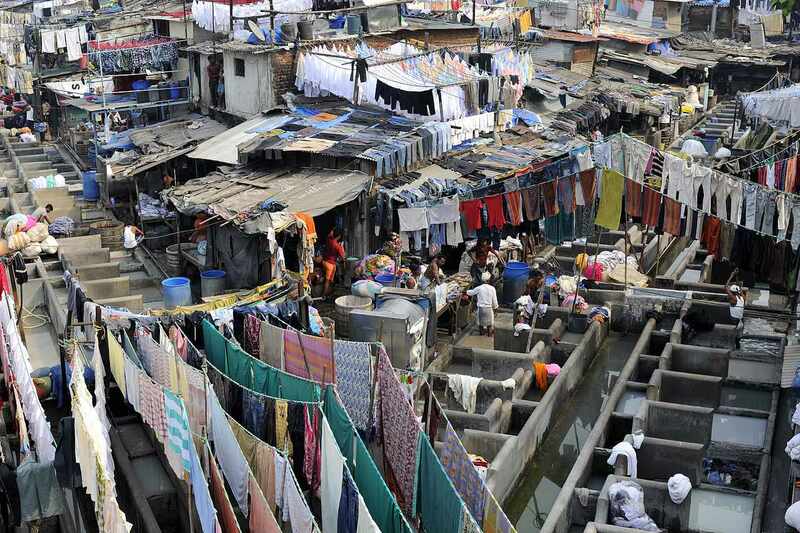 No-one should miss the Mahalaxmi Dhobi Ghat. It is probably the world’s biggest open-air Laundromat and it is nothing short of theatrical. Thousands of stick thin, muscle men of the Hindu Dhobi caste, wash a million items of cloths in hundreds of water-and-sud filled concrete troughs, beating them clean then hanging them on laundry lines, colour coded and ironing them before being returning them to their owners the same day. 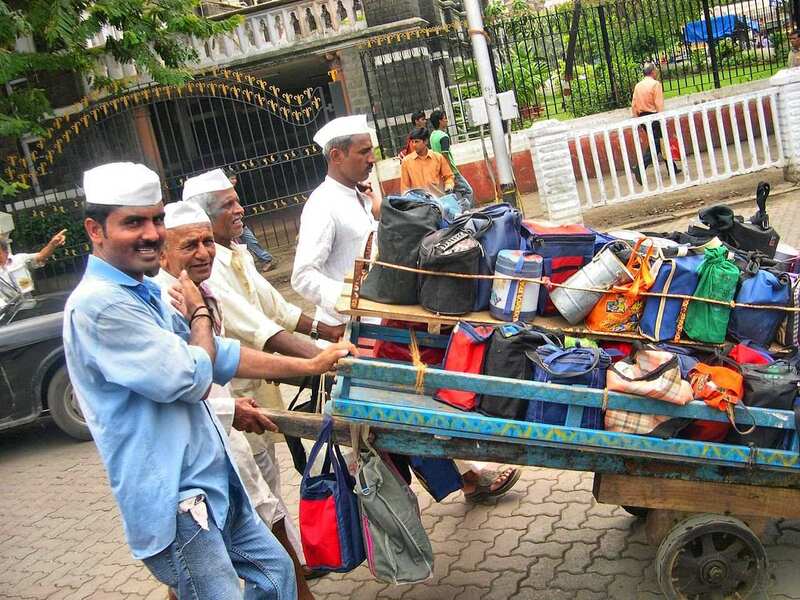 Then there are the dabbawallahs, dressed in white robes and white Gandhi hats, who descend on the city every day. At around 9.30am these packed-lunch delivery boys pick up nearly 200,000 home-cooked meals from the outer suburbs, store them, heat them at a central HQ and then deliver them at around 12.30pm to hungry city workers so that they may dine on home cooked food. It is the most ingenious distribution system in the world and one that fascinated Prince Charles. He turned up at the headquarters to watch as thousands of meals were stored, heated and then delivered in coded aluminium boxes (tiffins). The service is so good that it has even been entered into the Guinness Book of Records for efficiency. 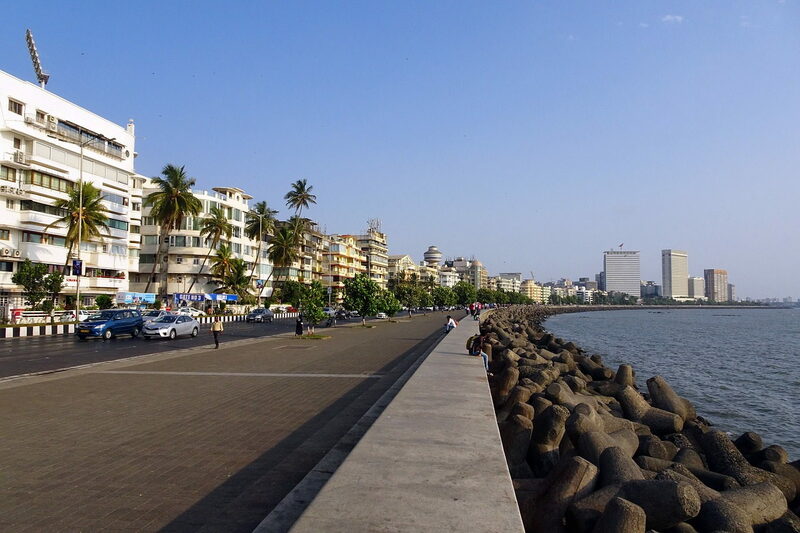 The most famous road in Mumbai is the coastal road Marine Drive which arcs along the shore of the Arabian Sea from Nariman Point to Chowpatty Beach right through to Malabar Hill. Laced with Art Deco buildings the promenade around Chowpatty is a very popular. Everyday as the afternoon sunshine dims into early evening, the promenade wall becomes draped with young entwined couples canoodling in the setting sunlight. As I watched on wondering what love story lay behind each intimate bubble, a passing stranger whispered cheekily in my ear, “you know they are smooching to kingdom come”. I remembered my Lord Shiva and as I plucked my figurine of the great Hindu god from the echelons of my bag and I crossed the road to find a patch of wall of my own to enjoy the final moments of the setting sun on the edge of the this magical city.